A year ago I bought a boring red ottoman at a yard sale for $5. Snore. But lovely legs, don’t you think? I get my fur from Mary Jo’s Cloth Store. This is the same fur I used to make the fur wreath years ago. 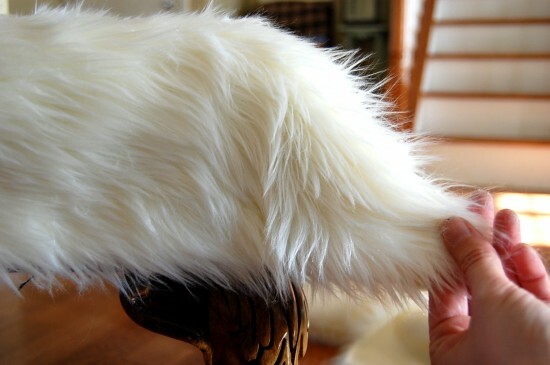 It looks luxurious and the hair is long~the longer the hair, the more forgiving the fur when it comes to hiding seams. This fur was $13.99 a yard and I only used about half a yard. In the store I don’t remember seeing as many $13 a yard whiteish furs but online there are many, my receipt doesn’t say which fur I bought, so sorry. Why do I insist on doing projects and not recording exact sources? This project was stress free and pure fun because if it didn’t work out, I only lost $5 for an ottoman that had been sitting around, and $7 for half a yard of fur. TOTALLY worth the risk of it looking hideous. You guessed it. I used a heavy duty super hot burn your hand to smithereens glue gun. Just run a strand of molten hot boiling liquid glue along the edge of the ottoman. 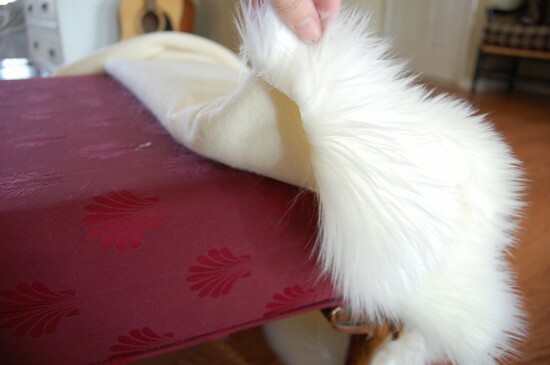 And then plop your fur back down and press down to attach it. Let it cool for about a minute or less if you are impatient. Don’t worry about the sides right now, just work your way up the front edge and then over the top. Fold back, glue, press down, fold back…. Don’t worry about doing it all perfect. Just work fast and get you some hot glue on there and then move right along. You don’t have to slather it everywhere, as long as it’s enough to hold you are good. 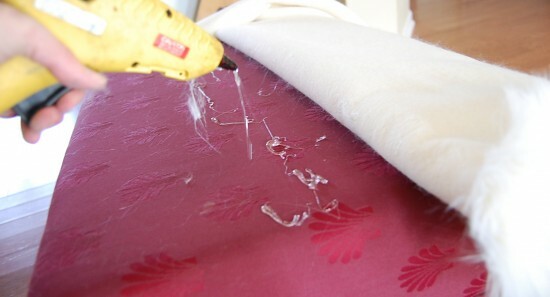 The up side about using a high heat glue gun is that the hold is much stronger than low melt/heat glue guns. It’s worth almost maiming your hands for. This is not how I hold the scissors~just the only way I could get a photo. It is easier to cut fur from the back side. Make sure to slip your scissors in under the furry side close to the backing so that you don’t chop off all the long hair. You need that part. OH NO!!!!! I made a mistake, I cut the fur too short, I have failed! No worries, that is why we are using fur, just pat the fur down and you’ll never see it. See? You can’t even tell. Now go ahead and glue down the side, do the same with the other two sides and we’ll talk about these corners. You’ll end up with these poofs on each corner. Cut a slit right up the middle. Then take one side and cut straight up. You’ll end up cutting off a little triangle shape. Do that for each part. This is what it should look like. And you simply put a little glue in there and then mess up the fur and the seam disappears. Isn’t fur amazing? Hides the seams like they don’t exist. It doesn’t look like that big of a mess but trust me, fur was flying everywhere. 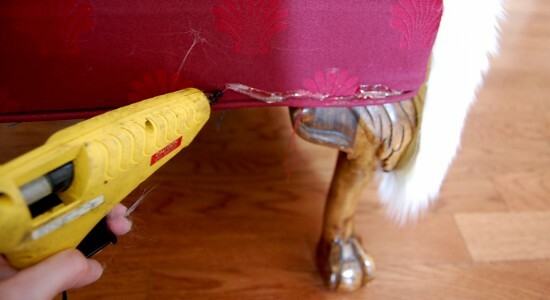 After you glue everything down, it’s good to vacuum the ottoman and the floor and yourself. Naturally, I like it in every room of our house. And depending on your mood you can make it more like Ty Pennington or slicked back like Kourtney Kardashian’s boyfriend. 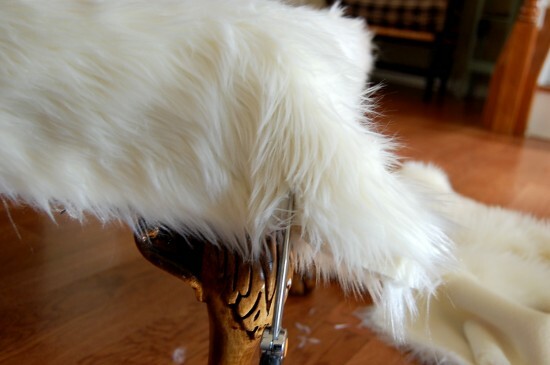 I didn’t make a fur ottoman because I had been dreaming of a fur ottoman. I made one because I had the ottoman already but I hated the fabric. I could have slipcovered it but, I wanted something daring, fun, super easy and different. Fur just seemed like an interesting choice. I wasn’t sure I could dislike it any more than I already did, so it was worth ruining. I bet you have something sitting around in your home that you don’t love. Is there a little risk you can take to see if you can make it better? What’s the worst that can happen? I love this. I would take anything that reminded me of Ty Pennington and I don’t think a 6-pack of soda would quite do it for me. I loved your posts below about thrifting-itis, or in my family’s case: hoarding-itis. All of it was just what I needed. Purging and rebuying new stuff is such a vicious cycle. And I loved reading all the good stuff on the small notebook–especially in her article about getting rid of paper and how she pretended she was moving overseas and could only take a few things with her. Hello eye-opener. Plus we’re getting our house ready to sell and even though we’re trying to get into someplace bigger, I don’t want to already be able to fill it with CRAP because I have so much of it. Anyway–I’m a little behind the party, but I’m glad I read it all today. I. LOVE. THIS. SO. MUCH!!!!! must find an ottoman ASAP. Love, love, love it! I will now have to find an ottoman to do this to to go in my den that I am currently redecorating. I have gotten so many good ideas from you, so happy I found your blog! This is so fun! I love the messy fur against the traditional legs. Love this! 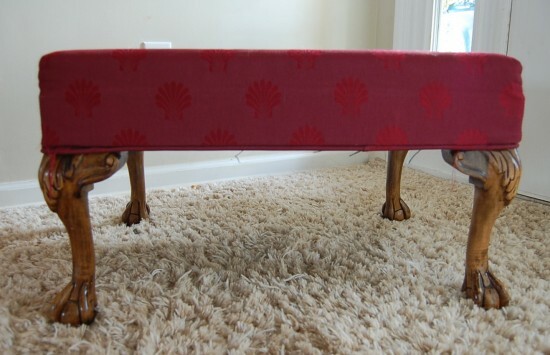 I will looking for an old ottoman to try this on. Okay-I just spit out my drink on the Kourtney Kardashian boyfriend-slicked-back-hair comparison. You rock, Nester. Not only are you amazingly creative, but you are hilarious. That is so great! I can’t sew and am always discouraged by posts that look like they involve sewing….but even I can do this! I don’t want to use this section to ‘push’ my own posts, but I just did one about ‘Pretend Sewing’ about this very thing! I totally love it! I’m just wondering though, how would you clean it?? Thats totally cute! It came out great and looks pretty easy to do! Thanks for posting! 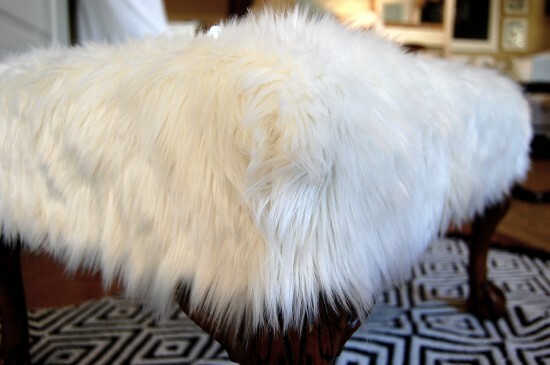 LOVE the fur ottoman- but know what i love best??? the picture of it with your manly man. I can’t believe you just referenced Kourtney Kardashian’s boyfriend… (as an ottoman.) That was so good. p.s. Love the project too! thanks for spurring us on to take a risk, once again. love you for that! If you get a sec., cause you are the Nester and all, and have lots of seconds for random blog browsing, i am asking for opinions over at my blog today on my style. If not, no problem! loved this project. and yes, she has lovely legs. I am not a fan of fur covered furniture. I think because MY furniture is always covered in fur. I have dogs…NUFF SAID. I think your home is beautiful. Thank you for sharing your ideas. Saw this on the CSI project and I love it! Especially that you hot glued it on!! This is awesome. I wonder how my children would feel about sitting on a furry bench to practice the piano? Do you think they would like it so much that they would sit there longer? Possibly become concert pianists, due to the luxurious fur covered bench upon which they sat to practice as children? I can dream. Personally I like to swish all the hair forward and call it a Bieberman. ok. that is pure awesomeness…but what is even funnier is that you filed it under..decorating dork! i just about DIED laughing…and i so needed that at this very moment! dork is one of my favorite words…yes..i know that is strange…but it’s still funny! thanks for the laugh! I’ve been a stalker for over a year now and love your blog. Your so funny! Your the goofy, knowledgable girlfriend I wish I had as a neighbor. Thanks for the tutorial. I had no idea how handy it was to have the glue gun & hemming strip as your bff. Have a good day and thanks for all your great ideas. I have the most awful faded red leather chair and ottoman from my husband’s single dad/bachelor existence. They’re comfy, but I need some ideas to bring them into my decor– ever slip-covered leather before?? What a fun idea! 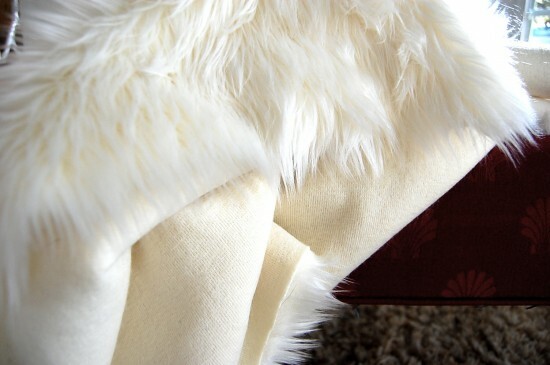 Now I really want to cover something in faux fur! I love the legs on that ottoman. DON”T ever paint it. How did you ever find that for $5 dollars! You could sell it for $75+ (to me.) Not much of a fur person myself, but I admire your creativity. I LOVE this! I want one :). This is so fun and I bet your boys LOVE it! I love all of the things you do — I wish I had the time to do more risk taking creative projects. 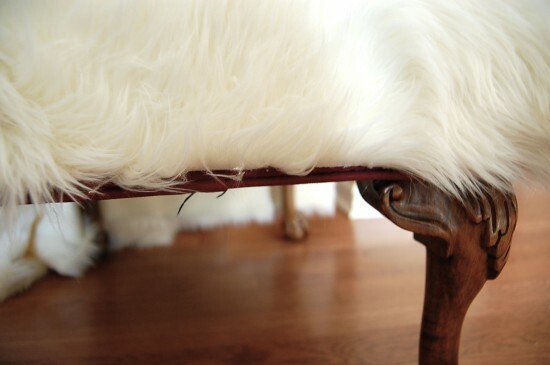 Love the legs on this little stool. What a wonderful job! I LOVE your great idea! 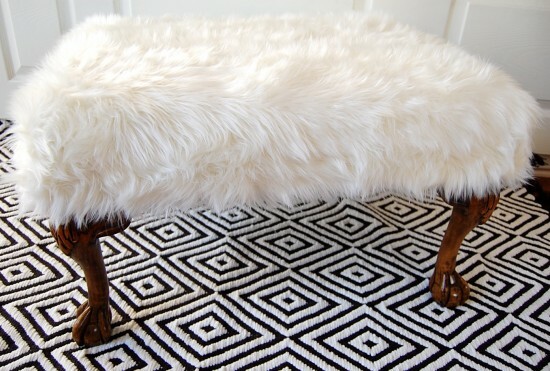 The ottoman is so ‘chic’!!! It has great legs, too. What is the paint colour on the wall of your den? I am looking for a true buff, so I thought I would ask. Love your posts on FB! 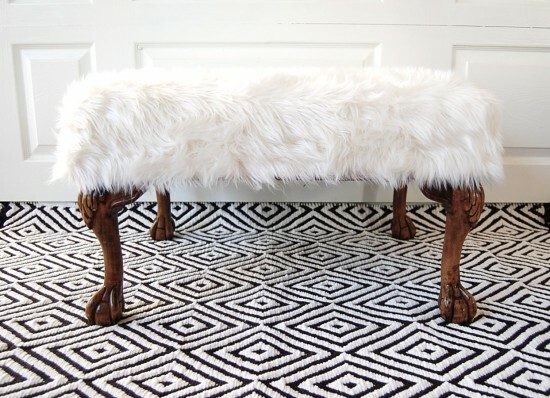 This foot stool is so much fun! && I can easily see how it could go anywhere! no offense but it looks like a llama without a head…. 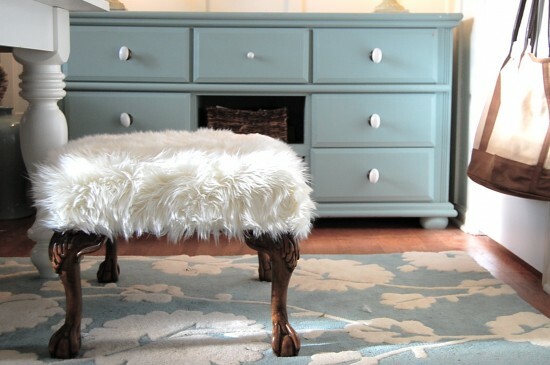 I loved this ottoman so much, so decided to recover my Daughter’s old ottoman. Everything went fine until the dreaded corners. I don’t know how far up to cut the corners and how much of a triangle to cut off. Hope you read these updates and can offer some advice. Thank you. 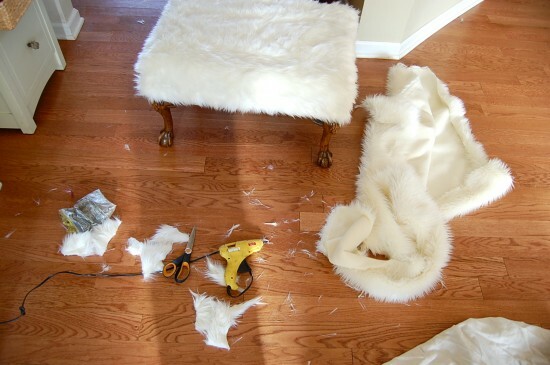 hey sheryl, if you glue the top on first, think of it like a present, you can slit the corners up to the top of the ottoman if you want, the long fur will hide the slits once you glue everything down. 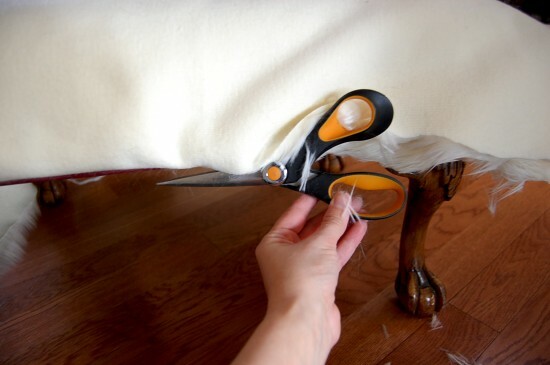 there really is no wrong way to do it as long as you don’t cut the fur short when you are making your cuts. I will give it a go today! Thank you so much! I did it! 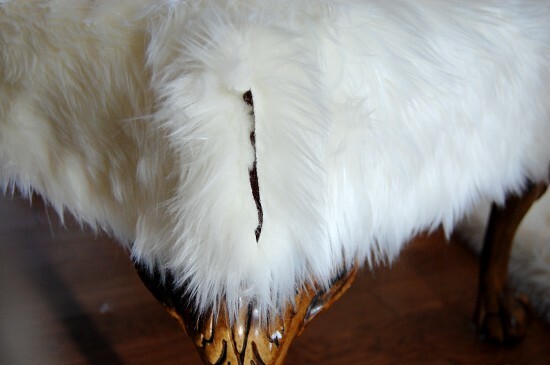 67 years old and I did my first fur ottoman! My Daughter will love it! She has a rare case of Rheumatoid Arthritis which attacks her organs. It has affected her lungs and she had to stop working as an RN because she is on oxygen. I’m doing everything I can to bring a smile to her face, and she will have a big one when she sees her “old ottoman” all spiffed up. Thanks again for your help. Hi! I love this. 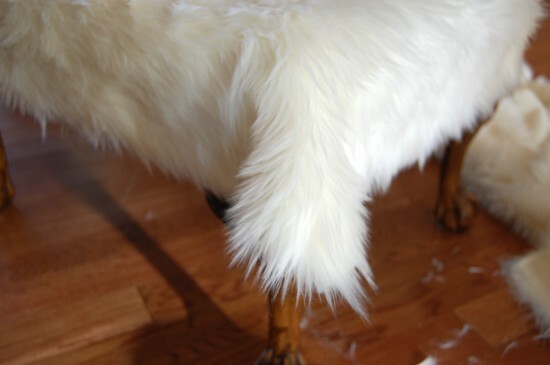 Going to reupholster an armless chair with fur like this. Where did you get the fabric? Thank you! I covered the old ottoman and also made a pillow covering. Where did you get the black and white rug under the ottoman?? Wow thats amazing idea reviving so old piece of furniture. Thanks for sharing! Really appreciate it.